How much money do cloud providers make? Don’s recent attempt to look at financials of 10 publicly traded “cloud” companies got me willing to expand his research to a bigger picture. After all, limiting the scope to 100% cloud companies really skews the charts to “Salesforce.com and everyone else” leaving such cloud juggernauts as Amazon and Google out of the picture. As Don notes, Salesforce.com is doing extremely well: in Q1 2011 the company demonstrated 34% year-over-year growth rate and made $504 million in revenue. Their 2010 revenue was about $1.66 billion. Companies like Google and Amazon are indeed much harder to analyze. Neither of them discloses cloud-related revenue which sort of vanishes in the grand scheme of core business such as respectively online advertisement and retail. In this blog post I decided to have a look at where these two cloud businesses stand. In August 2010, UBS Investment Research estimated that Amazon Web Services were on track to make $500 million in 2010 (up from $275 mln in 2009), and $750 mln in 2011 (out of total $44 bln revenue of Amazon as a whole). By 2014 they are expected to get to $2.5 billion. Profits are estimated to be around $58.2 million in 2010, $100.7 million in 2011. As a side note on the Infrastructure as a Service space, Rackspace is considered to be number 2 cloud provider and they are way behind Amazon with target revenue for 2011 set to $100 mln (for cloud services). Google Apps is Google’s core subscription cloud service, and again a small fraction of the total company’s revenue (and with Android’s success no longer the most cherished ‘secondary business’ either). Obviously ‘under $1 billion’ is a huge range. First of all, back then the number of customers was one-third lower: “There are 2 million small businesses that have signed up”. With that kind of growth, to get to a billion dollars in 3 years, Google Apps need to be making $300 million in revenue a year at the moment. On the other hand, when Google Apps were claiming 1 million users in early 2009, their revenue target for the year was $40 million. So with 3 times more users today, they might very well be at the 3 times the revenue – $120 million a year for Google Apps. My guess, is that the broad range ($120-$300 mln) might be related to them including or excluding advertisement revenue coming from free Google Apps accounts. I am actually quite impressed with how revenue of Salesforce.com compare to cloud businesses of Amazon and Google. For now I would probably just limit the analysis to these 2 vendors. Microsoft is trying hard to get into this business with their Office 365 and Windows Azure launches. However, to be fair to the company I would probably wait another year before discussing their financial performance. And that’s just for the software vendors. IBM‘s CFO Mark Loughridge claims that cloud services will generate $7 billion in revenue for his company by 2015, and I am pretty sure that hardware vendors are not losing money on shipping servers to all the new cloud datacenter either. Have I missed any of the big players you would have expected to see in this analysis? Let me know. 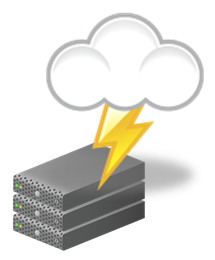 Is there hard ROI to use a cloud IaaS instead of a server in your garage/basement/on-premise datacenter? I think there increasingly is and justifying self-hosting is getting increasingly tough. I would actually go as far as posit that you can now get a server in a public datacenter at price comparable to your electricity bill alone! If you don’t believe me – let’s do a quick math. Almost 3 cents/hour for electricity alone not taking into account: labor, server hardware amortization, data-storage costs (replacing a failed disk), cooling costs, ISP costs, security costs (routers, firewalls, etc. ), power backup costs (a UPS) and so on. Mark notes that he could have probably bought a newer more energy efficient server – but the required investment would not justify the savings. Microsoft is rolling out their 5 cent/hour option (with additional further discounts if you pre-pay for reserved use – e.g. say you have a bunch of instances which you have running all the time and you are willing to pre-pay for the next few months). Same thing with Amazon: minimal price (although for a slightly more limited version) is already in 2 cent for Linux / 3 cent for Windows instance area, with reserved/pre-paid option getting as low as 0.7 cents/Linux & 1.3 cents/Windows. Rackspace pricing starts at 1.5 cents/hour for Linux, and 8 cents/hour for Windows. My take on these numbers is that you need to have a really good reason to go into hosting when there is so much price competition in that space and the margins are going down so fast. The only good reason I can think of is hosting being your competitive advantage in some way. For example, being a local hosting company in a country which legislation is making it hard to use foreign datacenters. Or offering some level of compliance which public hosters cannot provide. And as a matter of fact both of these differentiators are gradually going away with the vendors quickly getting all the possible certifications and compliance stamps you can think of, as well as opening datacenters around the globe. Cloud is cheaper than your own hosting regardless on how you calculate the costs. Get used to it. Seems that Microsoft is suddenly surprisingly extremely open on how they design and run their datacenters. Not only we have a write up by Michael Manos on their Generation 4 datacenter architecture (and a great concept video), but even more surprisingly James Hamilton is giving us a spreadsheet of their datacenter expense structure! Can you find information like that for Google or Amazon? The answer is no. Because the way they run their datacenters is a part of their competitive edge – especially for Amazon who compete at the infrastructure level where low pricing is important so efficiency is paramount. Why would Microsoft do that? Apparently these blog posts are not just something individuals put out but a concerted move by the company. My guess is that there’s not much they loose now by giving away that information: after all they are not really a player in that space today (Live is way behind Google and Windows Azure is at a very early stage), and even a smaller vendor going after Microsoft would like to mimic their approach achieving the same economy of scale and competing against Microsoft is not going to be that easy. However, the posts intent to help establish Microsoft’s credibility in the space (despite Hotmail success and a lot of other online efforts, the software giant is not really viewed as a web 2.0+ company). The message is: we are very serious about this market and this transition, and we are innovating and leading the industry to some kind of next generation approach leaving others behind. Who will be a Red Hat for Eucalyptus? Is someone going to step in and provide commercial support for the Eucalyptus open-source project basically following the Red Hat model which made Linux commercially successful and generated good revenue for Red Hat? We know that Amazon’s Web Services are rapidly becoming the de-facto industry standard for cloud infrastructure. The biggest complaints that people have against them are that they are only provided by Amazon, and thus lock you in one vendor and do not support the “private” clouds (on-premise deployment). Both of these could potentially be addressed by the Eucalyptus project which implements EC2 and (in the next release) S3 APIs and can be used on hardware of your choice. Eucalyptus team is not planning to use their project commercially and Rich Wolski is skeptical about competing against Amazon. The project is open source. In my mind this means that there is significant unsatisfied demand and a technology which someone could use to satisfy it. So my expectation is that we will see someone doing that. If not now then in next year when Eucalyptus is more feature-complete and stable (which is expected in the Spring). Now it is time to share a few general comments on the conference. First and foremost, cloud computing is happening. There was a lot of excitement and optimism throughout the event. And frankly this was quite contrasting to the SOA keeping talking about whether SOA is getting anywhere, how to justify SOA projects, whether it is a journey or a destination, and so on. This was a vendor event. I’ve met very few actual IT guys coming to the conference to learn more about their options. The vast majority of attendees were system integrators, plus some hosters, and venture capitalists trying to figure out how they make money on the trend. The whole space is very young. As someone put it: cloud computing is about 700 days old. That means that there are a lot of arguments about definitions, and where things are going, and so on. And that also gives a lot of vibe and a lot of fresh community spirit. A lot of vendors trying to redefine what they are doing as cloud computing or find a cloud computing game within their technology. 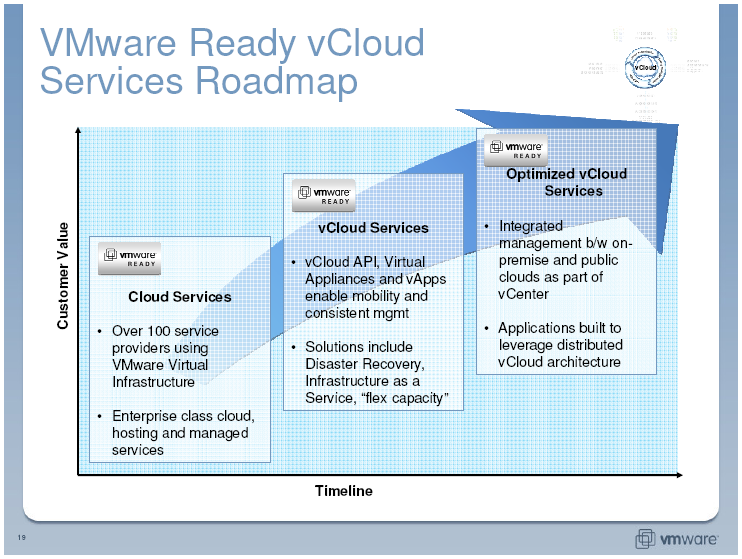 Obviously all hosting vendors are now cloud vendors, VMware is a cloud company, rPath is providing cloud virtual appliances, IBM is setting up clouds for customers, Cisco is giving everyone with the networks they need and so on. It takes time and effort to figure out what is real and what is hype. Next year the hype will probably just keep growing making this task even harder. We are mostly at the infrastructure level on the way to platform and management. If you think about what kind of cloud services can be there, the lowest level is infrastructure: you get the ability to run your virtual machines in someone’s datacenter (think Amazon EC2). Then, moving up the stack we have Platform-as-a-Service where instead of direct access to VMs you get the ability to submit your application code and let the platform do the rest (think Google App Engine). And finally, we have Software-as-a-Service – precanned applications which you just use and maybe somewhat customize for yourself (think Salesforce.com). By far most of the sessions I attended were at the infrastructure level. At the most you would hear a pitch of managing that infrastructure more efficiently, or having some kind of templates, or pre-built solutions you could use. I expect things to start changing as all these companies start trying to move up the value chain and provide more platform/services to differentiate from competition. In a sense you already see that with Microsoft’s Windows Azure which is somewhere between infrastructure and platform. Amazon is by far the current leader. There’s no one even close. Everyone integrates with Amazon. All value-add services are provided for Amazon first and then maybe for others. Someone was saying that Amazon’s Web-Services APIs might easily simply become the new x86 instruction set of cloud computing. Everyone is talking about not getting locked in. And everyone is pitching that only if you use their APIs or their machine/file formats – then you will become independent of the hoster or someone else. Basically avoiding one dependency by accepting another. Overall, very exciting times, and a great event put together by the folks at Sys-Con! For details on what was covered at the event and links to the presentations see my previous notes.